Jack Bugbee survived a near fatal cardiac arrest last summer that rendered him without a pulse for over 15 minutes. The aid of many people, from bystanders at the resort to both hospital and emergency response staff, combined to revive Jack defying all the odds. Jack Bugbee believes he existed in a state of grace one warm day last summer. He survived a potentially deadly experience that left him without a pulse for over 15 minutes. "I've always had a strong faith," said Jack, "but this really deepened my belief." The combination of medically-trained witnesses and a quick response by rescue personnel reinforced his certainty that nothing occurred by coincidence that July afternoon. Enjoying a leisurely day on the lake, Jack's son Paul had just finished skiing when Jack turned to him and said, "I'm gonna go skiing. You can pull me." At the time, Paul said he thought, "Why not?" His father had always been a strong skier. 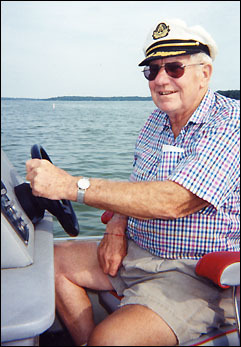 Jack, 79, had grown up on Lake Koronis, spending most of his adult life at Bug-Bee Hive Resort. 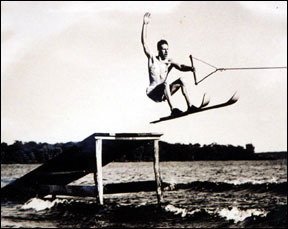 In the early 1940s, before water skiing was a popular sport, Jack and his friends learned to ski on a couple of wooden planks with a pair of tennis shoes screwed into them. In his day, he had performed tricks and jumps at water skiing exhibitions. As one of the original members of the Little Crow Ski Club, Jack was honored with a plaque and a charter membership. Growing up on Lake Koronis Bugbee and his friends spent many days aqua-planing - pulling a wooden disc behind a fast boat. - Jack went further by standing on a kitchen chair on top of the disc. In the 1940s, they taught themselves to ski and built this jump off the shoreline - life vests weren't a requirement in those days. Paul's wife Kella, a registered nurse and CPR instructor, was very reticent and urged Paul to talk Jack out of water skiing, something he hadn't done in a decade. Jack's wife Audrey later told Kella that he had been so excited when he went inside to put on his swim trunks that she got to thinking about putting on her swimsuit and trying it, too. Before getting his skis on, Jack was persuaded to wear a life vest, something that wasn't a requirement when Jack grew up. "I wasn't planning on grandstanding or anything," said Jack, "just a leisurely loop around the lake." When Jack started from the dock, he wasn't prepared for the force of the powerful engine, and was pulled right out of his skis and face down in the water. When he resurfaced, Jack said he wouldn't try starting off the dock again, but he'd try again starting from the water. When Paul circled back to drop the tow rope off, he saw his father's head fall back and his body go limp. Dan Karnes, a resort employee riding in the boat, dove in right away and pushed Jack towards the dock. Within 30 seconds, Paul had brought the boat up and with the help of a few people that had been watching from the dock pulled Jack from the water. "It's lucky we convinced him to wear that life vest," Paul said, "or he might've drowned before we could get him out of the water." While Kella quickly assessed Jack, one of the witnesses, Kurt Seiler, immediately started the breathing for CPR. Seiler happened to be a profusionist in cardiac surgery at a Tampa hospital. Kella, Seiler, and three others, performed CPR on Jack for over 15 minutes. As their efforts continued, their hopes faded for Jack's chances of resuscitation. Once CPR is started, the training mandates that it not be stopped until an emergency response team arrives. "What they tell us as instructors," Kella said, "is that less than five percent of those you attempt CPR on survive, and if a defibrillator is used, that number drops to two percent." "I almost told them to stop a couple of times," Paul said in a tight voice. "They just weren't getting a pulse." When the ambulance and the fire and rescue squad arrived, the rescue crew had to shock Jack with the defibrillator three times on the dock before detecting a faint pulse, then again on the way to the ambulance, and yet again as they sped to the hospital in Paynesville. When the ambulance arrived at the Paynesville Area Hospital, Jack was rushed into the emergency room where Dr. Tom Sult was attending. When the ambulance crew came into the hospital, Paul told them, "As soon as he wakes up, you're gonna hear him hollering in there." After surviving a near fatal cardiac arrest, Jack remains grateful to the many people that worked together to save him, the advances in medical technology, and the congregations that prayed for his recovery. Not two minutes later, Paul said, you could hear him in the next room saying, "Get this stuff off me." When Jack was stable enough to transport to the coronary care unit (CCU) at the St. Cloud Hospital, Paul rode along on what he called the "longest drive of his life." In the ambulance on the way, Jack was shocked twice more. After they arrived at the St. Cloud Hospital Paul said he was terrified that with all they had been through that day, he might lose his father while they asked question after question of Jack during the admitting process. An emergency angiogram was performed to determine what had caused the cardiac arrest. When no artery blockage was found, it was ruled to be ventricular fibrillation, where the heart flutters rapidly without actually beating. This is similar to a heart attack but a result of electrical impulses misfiring rather than corroded arteries. Though he had suffered a heart attack six years ago, Jack said he hadn't really given it much thought before waking up in the hospital. The best estimate the doctors gave was that a combination of circumstances - his prior heart attack, the excitement he felt getting set to water ski again, and the impact when he landed in the water off the dock - led to the the extremely fast fluttering in his heart that brought on the cardiac arrest. His prognosis remained touch and go over two weeks in CCU in St. Cloud. A series of complications - including pneumonia, poor kidney function, internal bleeding, and difficulty breathing as a result of the broken ribs sustained during CPR - finally improved enough for the doctors to release Jack to the Paynesville Hospital, spending an additional week in recovery. Jack now has a defibrillator, a device similar to a pacemaker, implanted in his chest. If he experiences an irregular heart rhythm, either too fast or too slow, the defibrillator will shock the heart to regulate the rhythm. The Bugbees have made it a point to recognize the nearly two dozen people - including members of the ambulance squad, fire and rescue personnel, nurses, doctors, and witnesses - that all worked together to help save Jack's life. Paul and Kella hosted a root beer float social and also gave Bug-Bee Hive Resort sweatshirts that read "Bug-Bee Hive Resort Life-Saving Team," to those who helped that day. "He may not know your faces," said Paul, "but someday when you're walking down the street wearing that sweatshirt, he'll see you and know you saved his life." 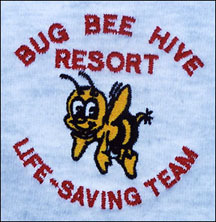 Paul and Kella thanked those that helped to revive Jack by giving them sweatshirts that read, "Bug-Bee Hive Resort Life-Saving Team." Jack continues to be humbled and slightly overwhelmed by the concern and interest in his story. He credits the amazing technology and excellent medical care he received, as well as good old-fashioned prayers for his recovery. "I question if at any other week in the summer that we would have had trained and qualified people that could've stepped in like they did," said Jack. "How can you help but recover," he continued, "there's more to it than coincidence." Though he has no memory from the time he ate lunch on Sunday until he woke in the CCU on Tuesday, he suffered no irreparable brain damage. "It must have hit me awfully hard," Jack said. "My recovery has been a long, slow process, but you could say back to 100 percent." Jack plans to water ski next summer, but said he'll check with the doctor first this time. Undaunted by his ordeal, he maintains you shouldn't have to give up something you thoroughly enjoy just because you're an old codger.